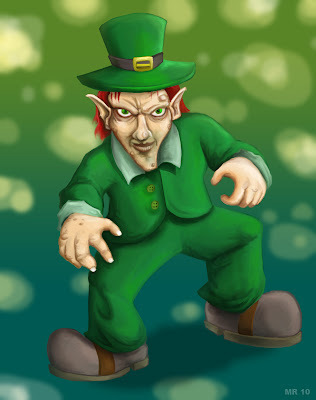 Leprechauns are sprites or fairy folk who originated in Ireland. They are described as little old men, three feet tall, wearing suits of red or green, with a cheery disposition. The Leprechaun hides a pot of gold at the end of a rainbow, and if captured will grant three wishes - most of which will usually backfire in some way. In modern times the image of the Leprechaun has been adapted into everything from a cereal mascot to a series of horror movies.